The other version of the 2 ingredient cookies were so good, and so easy to make, I decided to make the other kind shown at The Burlap Bag. What other mix-ins can you think of? 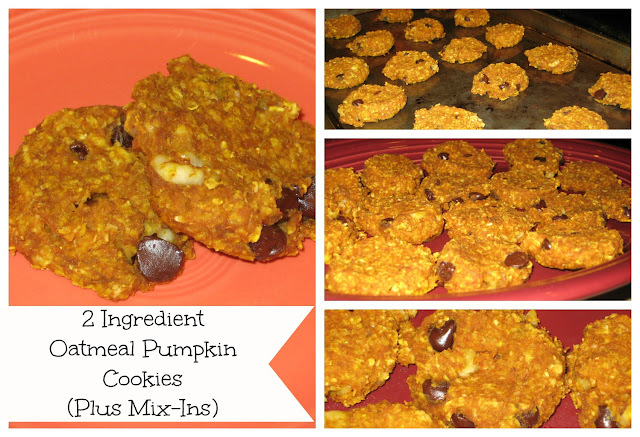 Combine the pumkin and oatmeal and add in your mix-ins. Scoop onto a greased cookie sheet with a cookie scooper. I used a spoon to flatten them into more of a cookie shape. Mine made 17 cookies. Bake them on 350 degrees for 12 minutes. They will be golden brown. Again... a guiltless treat! Depending on your mix-ins, each cookie is about 35 calories (1 PointsPlus). Which is better? Oatmeal Banana or Oatmeal Pumpkin? We loved the pumpkin cookies! They were the winner in our house. Which ones do you like best? Yes! Old Fashioned would definitely work. I have even used some like German Chocolate Oats from myoatmeal.com. Let me know how you like them!